It’s gorgeous out today, a taste of spring for sure. Our yard has little tulip, daffodil and hyacinth bulbs peaking through the gray dirt (yes dad, our yard is dirt, not soil yet). I can’t wait until they start blooming, more so I can’t wait until we have grass in our yard but that is another project down the road. 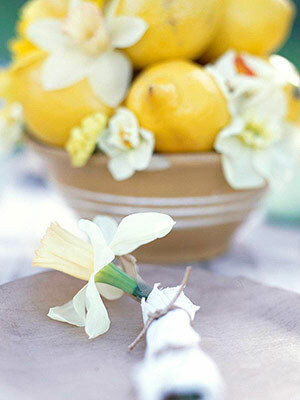 Here’s a little spring sunshine for you, daffodils! They’re onsale everywhere right now and they’ll last at least a week in a vase on your table. Just keep trimming those ends! A cyclinder vase and some ribbon – sweet and simple. 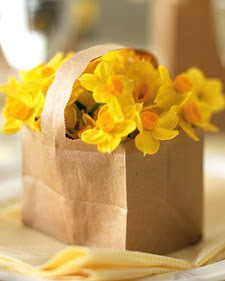 A paper bag basket, too cute!